From New Diver to Advanced! 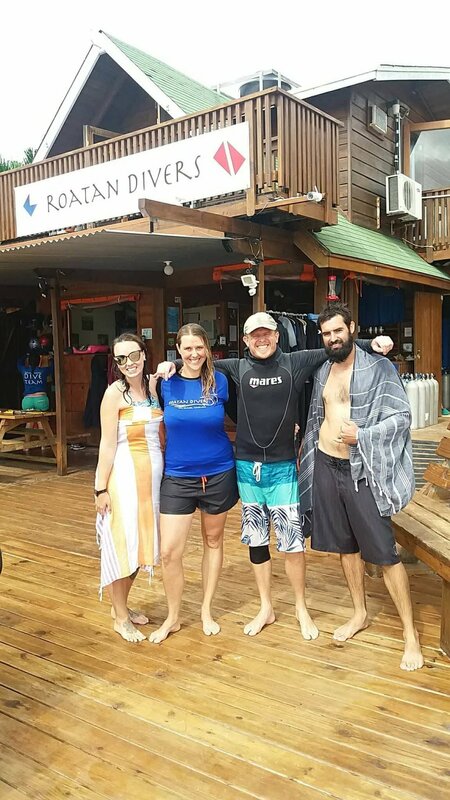 Congratulations to Monica, Melody, and Callum for completing their PADI Open Water Diver course and then onto their PADI Advanced Open Water course with Roatan Divers! These three are traveling through Central America on their way back to New Zealand after spending time in Banff, Canada. We were so happy to have these guys go from brand new divers to all the way through to their Advanced! There is no minimum number of dives for starting your Advanced course, so for these new divers, they had the additional travel time as well as interest level to keep on developing their underwater skills! Well done Melody, Callum, and Monica! Callum and Melody saw their very first hawksbill turtle and they LOVED it! finish their Open Water. Monica gives the OK after her Open Water. Monica, Melody & Callum are Advanced Divers. Hi, I'm Luke. I'm an Emergency First Responder. Congratulations to Luke for completing his Emergency First Responder course and his Rescue Diver certification, also known as "Better Buddy". When we first met Luke he was already an Advanced Open Water Diver, but decided he wanted to pursue his PADI Divemaster certification so these two courses come first. He was able to complete these certifications in about four days and Luke has said these warm Caribbean waters are very different from the cold waters of Canada where he first learned to dive. Luke is a dedicated and attentive learner and he did a great job on his Rescue course. We're very excited to have him here with us for the next few weeks as he begins learning what being a PADI Professional is all about. Gilbert, Morgan, Gabriel, Franchesca, and Gilbert did their Discover Scuba! We had this lovely family here visiting Roatan for the first time and decided they wanted to try our Discover Scuba Dive experience. A few of the guys in the group had previously tried diving before, but this was a great opportunity for them to go out again with Morgan and Franchesca. We started out in the classroom reviewing all the essential theory around diving. Next, we showed everyone how their equipment works and went over some key skills that are important to know how to do before you go diving. After that, it was time to go diving! Morgan and Franchesca were a bit nervous, but they still made it into the water. Going underwater wasn't for everyone in the family, but we were so proud of the whole crew giving it a go! Well done gang! Big round of applause for our PADI graduates this week and we hope to see them all blowing bubbles underwater someday soon!